If you are looking for the perfect recipe to impress, don’t look any further! 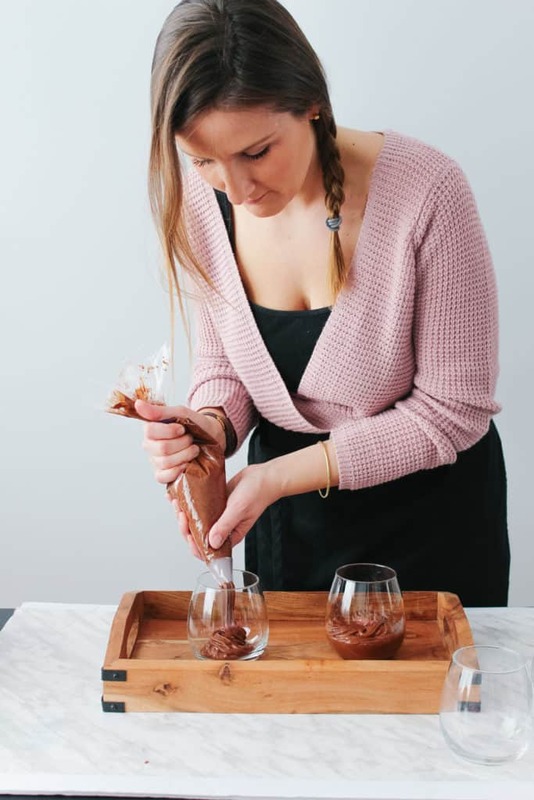 This is THE delicious chocolate recipe you need in your repertoire! It’s easy and not very long to prepare. 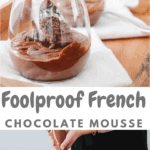 This mousse is firm but light, just the perfect texture. It is decadent and not too sweet, just enough, just what you need. WARNING: It is quite irresistible and you will have to be strong and work on your self control! But most of all, Valentine’s Day is around the corner. This week, I suggested a decadent chocolate tart and now you have this other option, a faster one for a last minute decision. Listen, I have made that recipe on many many occasions. Even last minute, my mousse was set aside during dinner and it was delicious. It was sufficient time. Too much to do? Prepared ahead of time to make your life easier, store in the fridge 24 to 48 hours. I actually can’t guarantee it can be saved that long, who in their right mind will open the fridge and ignore the chocolate mousse? Presentation is so versatile: Bite size in glass shots, I choose wine glasses. You don’t have any of these? No problem. How about a big salad bowl? Family serving. Add fresh fruits, a leaf of mint like in restaurant, sprinkle some chocolate, or put a cookie in it. The sky is the limit. This foolproof recipe has a secret for the best taste ever. Use a good quality chocolate, dark preferably and please please unsweetened. I have tried it with milk chocolate and trust me I actually often prefer milk chocolate but not here. Not with this chocolate mousse recipe. You need the real deal. Try it and let me know. There is no way you won’t love this recipe! Recipe adapted and inspired from the book French Cooking. Melt the chocolate and the butter bain-marie (hot water bath). In the meantime, beat the 6 egg whites. When it starts foaming, add the sugar gradually. (I use my Kitchenaid so I have my hands free to deal with the chocolate). Once the chocolate/butter mixture is melted, remove from the heat and add the egg yolks (3). Mix well. Once your egg whites are stiff and firm, incorporate the chocolate by folding carefully with a spatula. Pour in ramekins or any other dish of your choice and reserve in the fridge for an hour. I will Definately try this!! 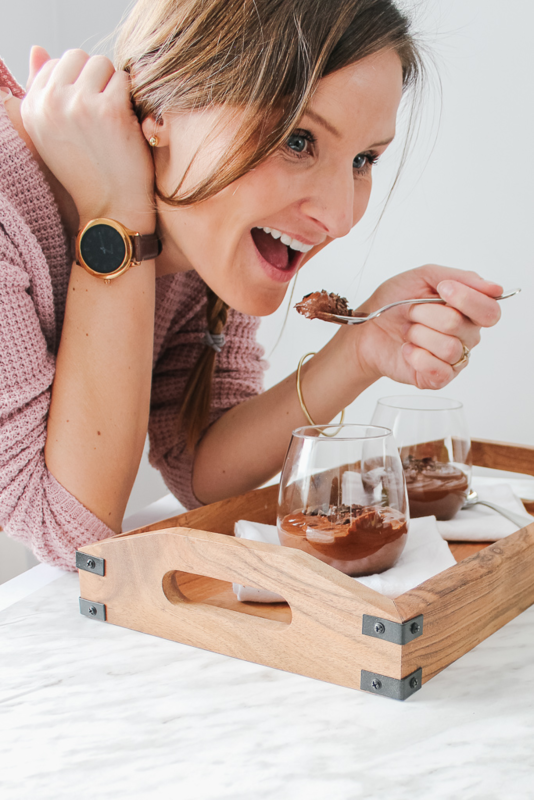 Bravo…..
Who doesn’t love a good chocolate mousse? And this one seems simple enough to make yet looks so rich and decadent! Bookmarking it! I think chocolate mousse just might be my fave dessert of all time. This one looks perfectly creamy and rich, and I love that you used dark chocolate. Delicious! 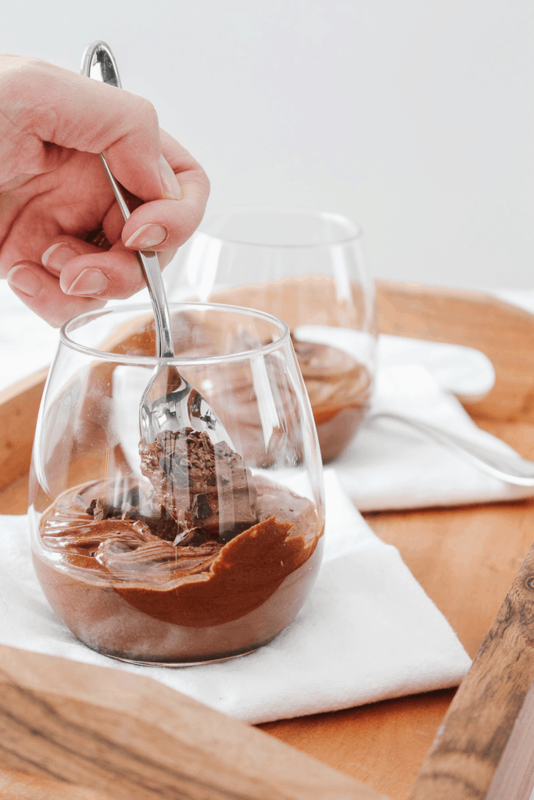 You can’t go wrong with a decadent chocolate mousse recipe! Always a crowd pleaser. And great advice on using a good quality chocolate! You definitely can’t wrong :)! Yes, it makes a difference, I can’t go back to any other chocolate now.